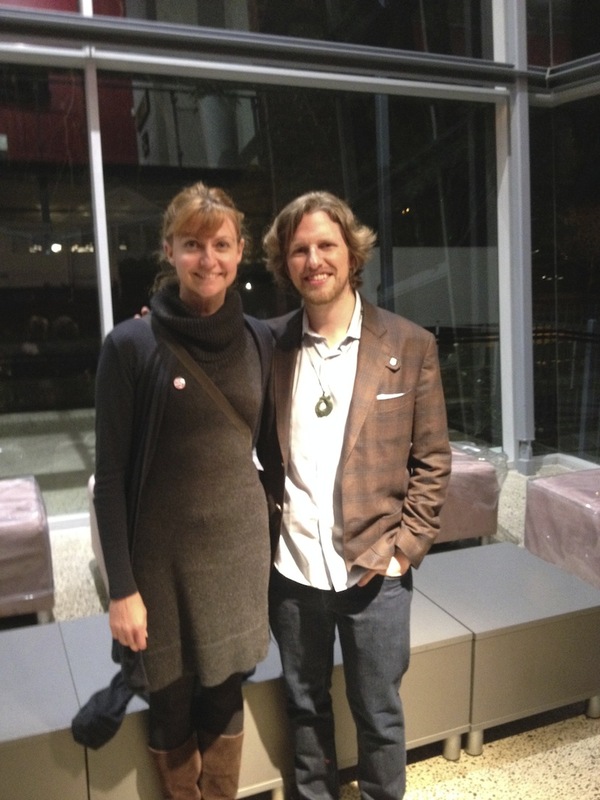 Matt Mullenweg was in Auckland last night to give a talk to all the local WordPress fans. Ok, so I also went to hear him talk and he was great: inspiring, funny, warm, friendly, and very down to earth. He spoke about the history of WordPress and how it started, where it is today, and where he wants it to go. He also talked about his passion for open source software. WordPress now powers 22% of the web. That’s 22% of all web sites run on WordPress software. That’s an extraordinary achievement. It’s really hard to disagree with any of these things. I’ve always loved the idea of free (as in freedom) software. Before I became a Mac user a few years ago I was a Linux chick for more than a decade. I felt a like a traitor when I switched over to a Mac and I blame the iPod touch for this. I bought one and it was love at first sight. I knew I wanted to learn how to create IOS apps and for that I needed a Mac. It was an agonising decision to say good-bye to Linux. Perhaps one day I’ll get another Linux box. There are just over 250 employees working for Automattic now and we are a distributed workforce which essentially means we all work from home. It doesn’t matter when I work as long as I’m producing output. I have never liked office corral farms. I find these places depressing and soulless. I also think I am more productive when I get to choose my hours. I work best first thing in the morning so I start work at 7am everyday. I work at least 8 hours a day but I can’t do 8 hours straight. Who can? So I work for 6 hours and then do other stuff when it’s my afternoon. Then in the late afternoon – early evening, I pick up where I left off and do some more work, refreshed by the extended break. Having a schedule is important when you work from home as is sticking to a routine. As Matt said in his talk, what matters is not whether you spend 10 hours a day at the office, dress nicely, and get on with all of your colleagues: what matters is how productive you are. Posted in WordPress and tagged Linux, Matt Mullenweg, Open Source, open source software, WordPress. Bookmark the permalink. I am impressed. But I may disagree with Matt Mullenweg a little when he says that it does not matter whether you dress nicely and get on well with your colleagues, but it only matters how productive you are. Of course, being productive is important and satisfying, but not being concerned about colleagues is a definite negative, not only personally but also for the long term interests of the organisation. In my experience, those workers with good interpersonal skills always go further and contribute more to the organisation that those without. It also more fun in life to enjoy the company of colleagues. After all, we spend such a long time at work. This isn’t exactly what he meant and it’s my fault for not explaining it very well. I probably should have quoted Matt but I can’t remember exactly how he phrased it. He did not say that good relationships with work colleagues are unimportant, but rather if you do the first three things – turn up for work, look presentable, and get on with colleagues – but don’t actually get any work done, then it might look as though you’re doing a good job when actually you’re not really doing much at all. I don’t think anyone could say that relationships with one’s colleagues is not important. Thanks, Graham. Yes, I know I can do this but it defeats the purpose to have an open source operating system running inside a proprietary one, don’t you think? I’m terrible at working from home! I need someone standing over me all the time, or at least the lurking presence of the Big Boss. But I think you have such a wonderful opportunity, Rachel, to work for a company with such a vision. And amazing to find out that WordPress powers so many sites. Yeah, working from home is not for everyone but it suits me perfectly. And I agree, I feel very fortunate to be a part of WordPress. It’s a great opportunity. But who knows if I work in the morning or in the middle of the night? Exactly. It’s so nice to have the freedom to choose your own hours. Having that flexibility is priceless. Some people work best late at night. I’m not one of them but allowing employees to work at times that suit them is likely to be in the interests of the organisation as well.